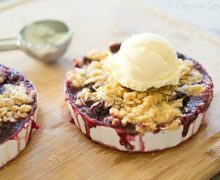 Blackberry Crisp - Easy Fruit Crisp Recipe with Vanilla Ice Cream! 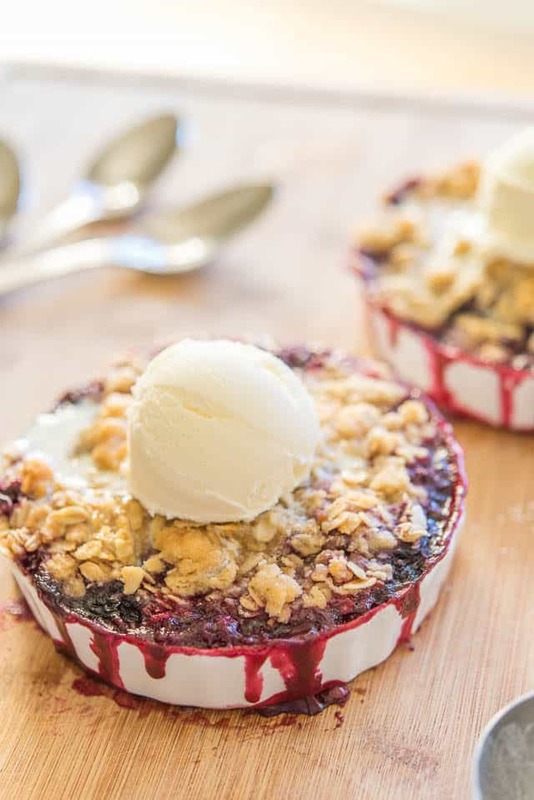 This delicious Blackberry Crisp is made with blackberries tossed in a lavender-infused syrup, and topped with a crisp and crumbly oat streusel topping. Serve warm with a scoop of ice cream! 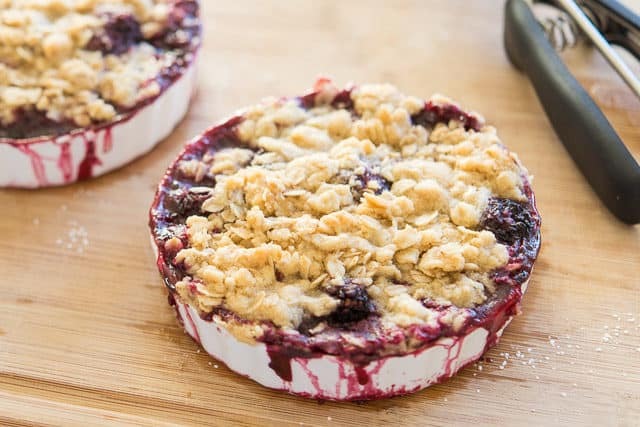 A fruit crisp is one of those perfect desserts that is really simple to make, but good enough to serve at special dinners or parties. There’s definitely a reason it’s often on restaurant dessert menus. 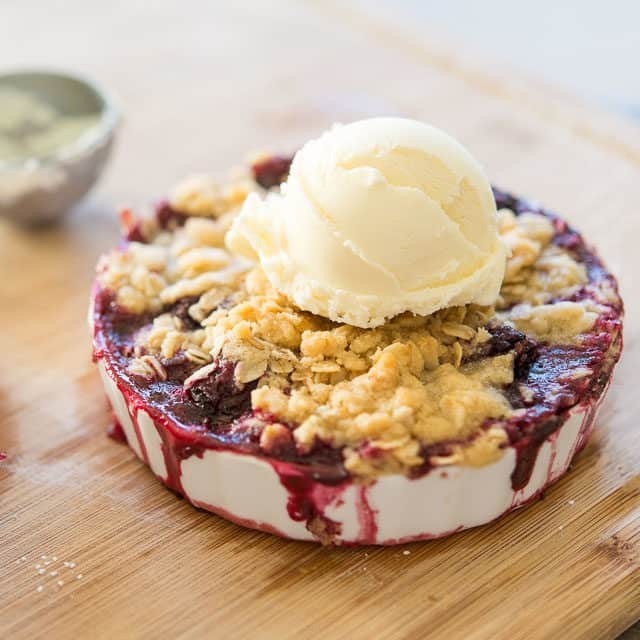 When berries are in-season in the summer, crisps are a great way to let the fruit shine with some supporting players, but truthfully you can make this blackberry crisp any time of year using frozen berries. It still tastes fantastic, and has a similar texture. This is optional, but I like to make a lavender infused syrup for the blackberries. I think desserts infused with lavender are so lovely, with two of my other favorites being these Lavender Shortbread Cookies and Lavender White Chocolate Lace Cookies. You can get dried lavender either online or sometimes in the spice section of the grocery store. Let it cook to infuse the sugar with the lavender, then add it to your berries along with cornstarch. If you’re not using the lavender, you can simply toss the sugar, brandy, and cornstarch with the blackberries. Next pile on the oat topping, which is made with butter, flour, brown sugar, and oats. By the way, the difference between a crisp and a crumble is that the topping of a crisp contains oats, where the crumble does not. However, people often use the names interchangeably! 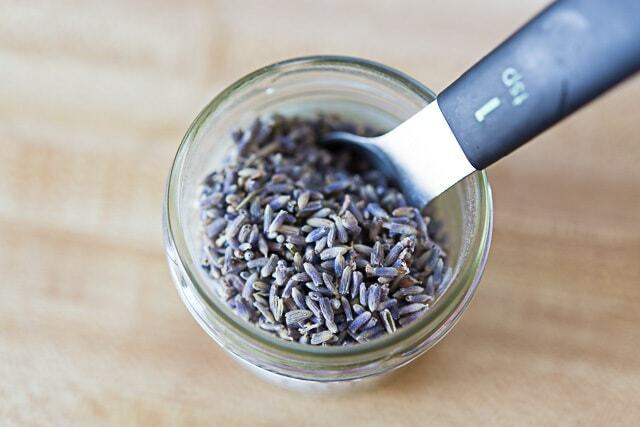 Combine the sugar, dried lavender, and brandy in a small saucepan over medium high heat. 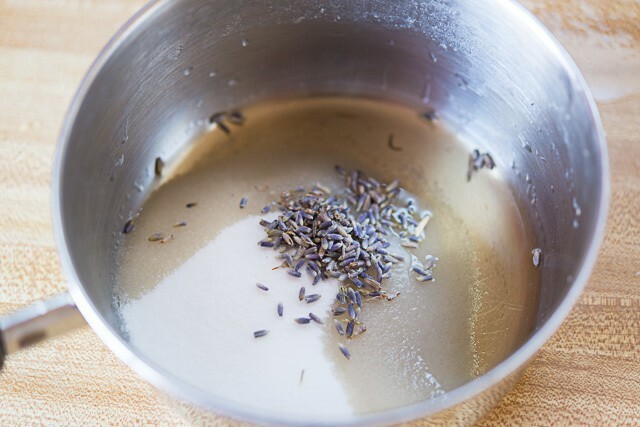 Cook until the mixture turns clear, then continue cooking for five minutes to allow the lavender flavor to infuse into the sugar syrup. Strain the lavender out and pour the infused syrup all over the blackberries. Sprinkle the cornstarch all over the berries, and stir to distribute. 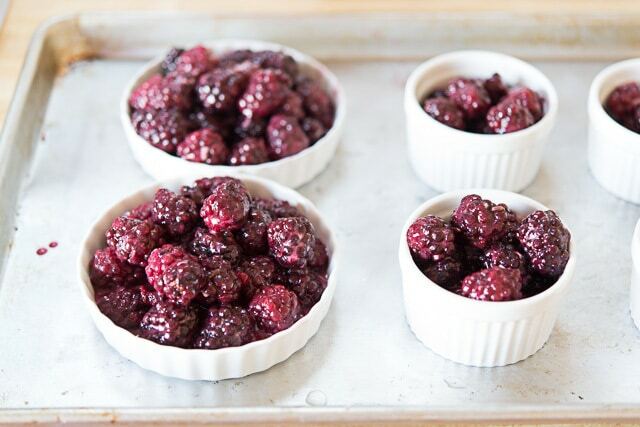 Portion the berries in six 4oz ramekins (or whatever dish you desire), and set the ramekins on a sheet pan. To make the crisp topping, whisk together the flour, oats, brown sugar, and salt. 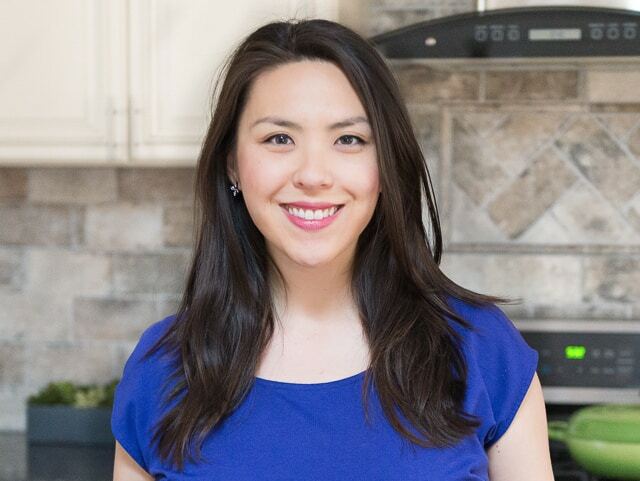 Add the cubed butter and squish the butter pieces with the dry ingredients using your finger tips, until the butter is well coated with the crumb mixture and broken into small pieces. 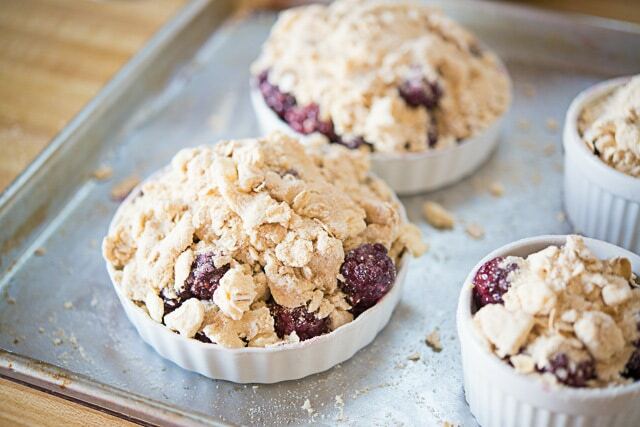 Distribute the crumb topping on top of the berries. Bake the crisps for 30 minutes, until the blackberry mixture is bubbling. Serve warm with a scoop of vanilla ice cream. Enjoy! Post updated in June 2018 with photos and writing. Originally published May 2014.
i would love to be able to eat all that gorgeousness but i can’t eat any wheat product or byproduct ? Hi Mary, I’m sure you could use gluten free flour for the topping! Just that combo of lavender and blackberry….mmmm sounds so good! The lavender is such a great addition! And the ice cream on top is a must!